Despite years of evidence to the contrary, we Brits envisage every summer to be a scorcher: hazy park afternoons, BBQs, warm beers and tanning oil sessions in the garden (admit it). Granted, rain often ruins our hopes and dreams, but that doesn’t mean we can’t make the necessary style preparations. Although sports luxe, Americana and the 1990s are set to be huge trends this season, these ultra-casual looks can be a huge turn-off for the classicists in our midst. Enter the modern safari. Sharp and simple, safari-inspired pieces can be used to create a raft of timeless, refined and comfortable warm-weather ensembles. Neutral hues are fused with utility-driven designs that exude masculinity and are able to adapt to almost every summer occasion. Garish casuals be gone – rugged pieces and classic tailoring is back on the style agenda. It’s time to channel your inner expeditionary – think Indiana Jones, 1960s Zambia and a scene from Out Of Africa for the ultimate modern safari look. Dusty, sandy shades are what immediately spring to mind when building the palette for this aesthetic, with khaki, beige, cream and white not only on trend this season but also perfect for combating rising temperatures. The key piece within any modern safari look is, of course, the safari jacket. 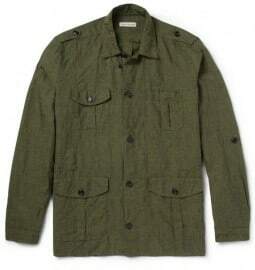 Historically, safari (or bush) jackets represented the central item of the British military’s tropical uniform, worn by soldiers in the African bush. Traditionally featuring four or more expandable pockets, an attached waist belt and epaulettes, they were designed to be lightweight for easy mobility but warm enough for when the African sun set. Combining utilitarian convenience with a minimal design, the safari jacket perfectly balances fashion and function. Typically constructed from breathable cotton drill or poplin, they can be worn during balmy spring/summer days without becoming stifling, providing an extra layer of insulation when the temperature drops in the evening. A definitive choice is the classic four-pocket, waist-grazing design in a khaki shade. Easy to wear, sharp and an excellent choice for the transition into autumn, every retailer from army surplus stores to high street stalwarts now offer their own take. Alternatively, you can opt for a more contemporary version: contrast pockets, statement zip closures and unconventional materials are all available on the current market. A belted or cinched waist is optional – they offer definition for muscular gents (those with the desirable ‘V’ body shape) and can even give the appearance of longer legs due to the vertical line being broken higher up the body, making them suitable for shorter men too. However, perhaps the greatest strength of the safari jacket is its versatility. 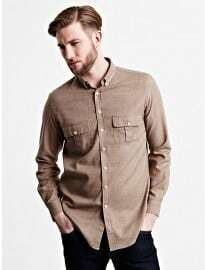 Dress it up with a shirt and slim-fit trousers/chinos for evening drinks or throw it on with a jeans and t-shirt combination at the weekend – this key piece will quickly become a go-to wardrobe staple. 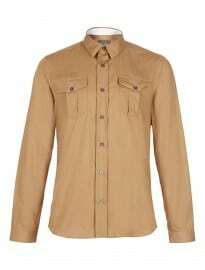 Clean, classic and simple are the three prerequisites for a modern safari shirt. Hot sweaty summers demand a sense of comfort from every piece you wear and as such, you should opt for lightweight cotton- or linen-blends. White and cream are timeless options that will slot seamlessly into a wide variety of looks and continue to get good wear for many years to come. Although seemingly a safe choice, you can individualise your shirt via detailing: single button chest pockets, epaulettes and rolled tab sleeves are just some of the utility references that complement this practical, outdoors-inspired aesthetic and will help subtly separate your outfit from the crowd. If you’re looking for a true high summer option, short sleeved versions are most welcome and very much back on the radar this year thanks to the likes of Jil Sander, Miharayasuhiro and Burberry Prorsum. Alternatively, if you’re a long-sleeved man, roll up the cuffs for a rough and ready feel. Just remember, too clean and pristine jars with the rugged safari influences – you’re supposed to be fresh from the savannah, not Savile Row. Beige/khaki legwear is essential to the modern safari aesthetic, with above the knee shorts and slim-fit trousers/chinos setting the foundation of your outfit. Yet while these traditional pieces offer many advantages, contemporary styles can add a unique, on trend twist. The recent resurgence of slimline cargo pants is wholly relevant to this look thanks to their functional design and utilitarian edge. And, as an added extra, fitted shapes in beige, sand or stone provide a form-flattering choice for the majority of body types. Experimental dressers can even look to create their own individual take on the current short suit trend by pairing matching shorts with their safari jacket – this combination is actually referred to as a safari suit and offers a slightly more relaxed take on one of SS14’s key looks. When it comes to a safari wardrobe, one footwear silhouette immediately springs to mind: the desert boot. Practical, comfortable and completely timeless, a quality suede pair in dark brown, beige or mahogany is an essential addition to any modern gent’s shoe collection. Although desert boots are available at all price points on the current market, you can’t beat the originals from Clarks for durability, comfort and overall style. Continuing the outdoors theme, leather hiking/walking boots and suede worker/chukka boots are more than applicable to this aesthetic. Worn-in materials (think scuffed suede or burnished leather) and functional touches add character and a sense of authenticity – there’s nothing more masculine than looking like you’ve just left the Grand Canyon. However, we all know that boots can quickly become uncomfortable in the heat. When temperatures rise, consider utilising a pair of suede Derbies or brogues in sandy or earthy hues – both of these will look superb with well-cut shorts/trousers and a sharp safari jacket. Once again, modern safari style demands a pared-back approach. Watches should be classically decorated with a basic leather or nato strap, while anything remotely regal should be avoided – too much flair and you’re treading down the precarious dandy route. Bold toned socks are a solid choice. Warms reds, greens and yellows add vibrancy to an incredibly neutral look – this aesthetic is timeless and classic but head-to-toe monotone can quickly become boring. Fight any accusations of tedium with flashes of colour for a more playful sartorial approach. Other key pieces include traditional high summer accessories: straw hats and sunglasses serve a purpose when the sun is shining and tie in with our practical, utilitarian ethos. Just remember to pick the design or shape that best suits your specific face/head shape. Finally, a leather cross shoulder or messenger bag is ideal for carrying your everyday essentials. Skip the bulky holdall and trend-led tote this season, lightweight practicality is what we’re aiming for here. The modern safari aesthetic is a classic and practical warm-weather option that also ties in nicely with many of SS14’s key influences – an excellent example of adjusting and manipulating current industry trends to fit in with your own refined and timeless approach to style. So, why not invest in a couple of pieces this season and play the ultimate style hunter? Navigating the fashion wilderness has never been simpler.